Feast Day - 14th August. Raymond Kolbe was born in Poland. When he was just a teenager, he joined the Franciscan order and took the name Maximilian. He loved his work and enjoyed studying to become a priest, and he especially loved the Blessed Mother. Kolbe started a monthly magazine called "The Knight of the Immaculata" so that more people would know about Mother Mary. He and his Franciscan priests worked hard to make the love of Mary known. In 1938, the Nazis invaded the Poland and it was the beginning of World War Two. In 1941, the Nazis arrested Father Kolbe and they sentenced him to hard, manual labour at Auschwitz concentration camp. Three months after he arrived at Auschwitz, a prisoner managed to escape. The Nazis became very angry and decided to punish the rest of the prisoners.They decided to choose ten prisoners and put them in a bunker without food or water so that they would starve to death. All the prisoners stood straight, while ten men were pulled out of line. One prisoner they chose, was a married man with a family. He begged and pleaded to be spared for the sake of his children. 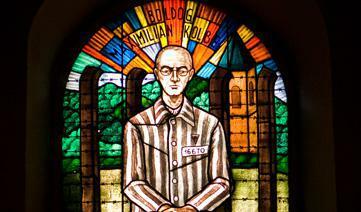 Father Kolbe, who was listening, felt deeply moved and decided to help that suffering prisoner. He stepped forward and asked the commander if he could take the man's place. The commander agreed. Kolbe was canonized on 10 October 1982 by Pope John Paul II. He is the patron saint of drug addicts, political prisoners, families, journalists, prisoners, and the pro-life movement.